Since last week’s blog was a rant about pre-marital furniture, I thought it only fair to present an alternative view this week, by arguing for the virtue of our Ancient Admiral Kitchen Stove, another hangover from my husband’s first marriage. Perhaps “hangover” isn’t the most apt choice of word. 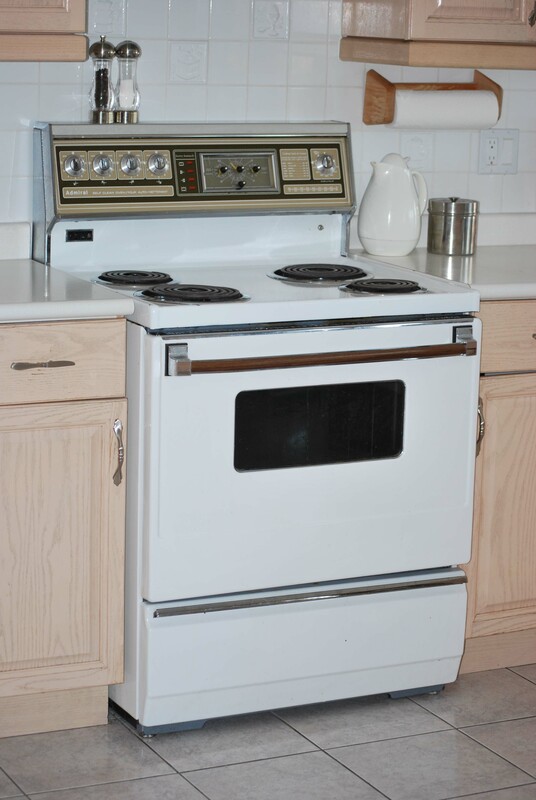 Legend has it that this stove was part of the deal when my husband and his first wife bought a second house back in the 80s. If Maureen wanted this baby back, I’d wrestle her in jello for it. Why? Because it was manufactured in an era when stuff was built to last. Remember that old chestnut? Built to last. 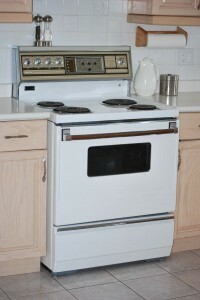 This baby probably outlasted every other appliance in the house. The Admiral isn’t pretty, at least not by today’s standards. It’s rather something you’d expect to see at a roadside junk dealer with a cardboard sign “Perfect for the cottage: $40.” If I lived in a quaint little cottage on Lake of Bays, I suppose we could label it “vintage” and it might be chic. Probably not though. More than one of our neighbours, standing in our kitchen with a glass of wine in hand, have asked why we don’t buy something tonier, more in keeping with the style of our home. Why not stainless steel? An energy-friendly gas range? Something that’s, you know, chef quality. I can hardly make scrambled eggs without setting off the smoke alarm. I don’t need chef quality. All I need is something that doesn’t self-destruct after a six months, something that lasts, unlike the fancy-pants blender I bought from our high-end grocery store last year. Sure, it had counter appeal – all sleek silver-and -black and sporting a self-important spigot – but after seven months, it stopped blending. Meanwhile, the old model that came attached to my husband is still grinding, chopping and pulverizing . It’s like Kanye says: Damn they don’t make ’em like this anymore, I ask ’cause I’m not sure, does anybody make real sh– anymore? I don’t know, and I’m not going to waste time and money finding out. We’re keeping the Admiral.